For other uses, see Sahand (disambiguation). Sahand (Persian: سهند‎), is a massive, heavily eroded stratovolcano in East Azerbaijan Province, northwestern Iran. At 3,707 m (12,162 ft), it is the highest mountain in the province of East Azarbaijan. Sahand Ski Resort is on the northern foothills of the mountain and near the city of Tabriz. In the complex the Sahand Skiing Stadium has a 1200 meters length ski area and skiing and snowboarding is practiced in the resort. The snow sculpture competition, which runs once a year at mid-winter in the stadium, is a famous entertainment that attracts spectators and competitors from all over the country. 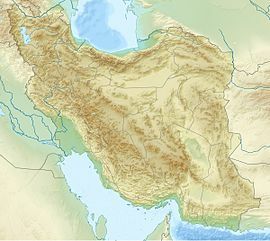 ^ a b c "Iran: 54 Mountain Summits with Prominence of 1,500 meters or greater". Peaklist.org. Retrieved 2014-05-25. ^ Scheffel, Richard L.; Wernet, Susan J., eds. (1980). Natural Wonders of the World. United States of America: Reader's Digest Association, Inc. p. 330. ISBN 0-89577-087-3. "Sahand". Global Volcanism Program. Smithsonian Institution.